The International House of Reiki believes in putting back into the community and supports numerous charities. Hands-on, back in 1998 the centre began volunteering its services when it first started up in Darjeeling in India. Frans and Bronwen Stiene would travel out to the tea plantation villages and treat the locals, eventually teaching a group of 12 students to set up their own local Reiki clinic on weekends. Over the years the centre has worked with groups such as Yoga in Daily Life to support children in Africa and India. Yoga in Daily Life raises money for a children's school in Rajasthan (at the Yoga in Daily Life ashram). Students and teachers from IHReiki have offered free Reiki treatments to paying clients from the yoga centre and all money raised goes to the school. Due to the effort of groups like the International House of Reiki, Yoga in Daily Life has been able to acquire a bus, jumpers for the children and even a computer for the school. The numbers of children attending the school has risen drastically due to the quality services and education that are being provided. The centre has also helped support a Tibetan girl from Darjeeling, India with her living expenses while she studied Literature at Grand Valley State University in Michigan USA. The winner of the 2005 raffle to raise money for her is Robin Haines. 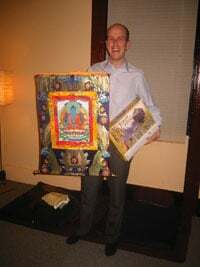 Robin won over $900 AU of gifts including a traditional Tibetan thankgka (painting) of Medicine Buddha, two books - The Japanese Art of Reiki and The Reiki Sourcebook and a copy of the amazing computer game Journey to Wild Divine. Tsering has now completed her undergraduate studies. During her time at university she sent us regular updates which we recorded on our website. Other methods of raising money for Tsering included donating money earned through our online program The Three Diamonds. We met Tsering and her parents when we lived in Darjeeling. Here's an article we wrote about our friendship called Tsering's Story.